Available at AbeBooks, Alibris, Amazon, Barnes and Noble, Xlibris and other online sources, or through the service desk of fine bookstores everywhere. Available in Kindle and Nook formats. Click the appropriate link to download to your favorite electronic reader. Canada, France, Japan, the United Kingdom, and others. Interested in Whistler's Gold? Click to read the first chapter. Written for young adults, but enjoyed by readers of all ages. John W. Sloat (Edinburg, PA), author of A Handbook for Heretics, co-author (with David Sloat) of The Calm and the Strife: A Novel about Gettysburg, and others. Whistler's Gold is an eye-opener for an easterner like me. [Winterton's] book reveals a country, a culture and a way of life foreign to those of us who live east of the Mississippi. The story contains a variety of elements: a love affair, a murder, a robbery, a whistling ghost, and a search for lost gold. The characters are realistic and likeable . . . the ending is surprising and tense, and the resolution is very satisfying. Evelyn David (Tulsa, OK), author of Moonlighting at the Mall, Missing in Lottawatah, and others. 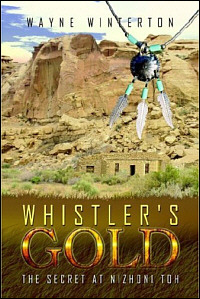 Whistler's Gold is a modern western that reminds me of the magnificent Zane Grey books I read as a child. [It provides] ... a delicate watercolor portrait of life on the Navajo Reservation. I highly recommend this book for readers young and old who like a mystery mixed with light touches of romance and western history. Mike Clark, Freelance Writer, Special for The Durango (CO) Herald, Arts and Entertainment. Winterton possesses an undeniable gift for plot that carries Whistler's Gold through a satisfying series of contortions and seemingly unsolvable problems to a gratifying conclusion. There is also an air of innocence about the whole enterprise that never goes away, from the first page to the last. Kim Noteboom, Editor, Arts and Entertainment for The Farmington (NM) Daily Times. Winterton writes about the Four Corners as only a person who has lived in this rugged area could. Whistler's Gold is a great story that shows that gaps between cultures can be crossed. It's a sure win for readers who like heartwarming stories filled with intrigue and mystery. Sylvia Buck, (Sun City, CA), from a review on the Barnes and Noble website. I enjoyed every minute of this book. I love the history mingled with the fiction of the story. It is a painting with words and makes me want to visit New Mexico and meet the people about whom he writes. I have recommended this book to several friends. Sharon Schulz-Elsing, (Sioux Falls, SD), Contributing Editor, Curled Up With a Good Book. Click here to read Sharon Schulz-Elsing's full review. Winterton carves his own place in the desert cliffs of Southwestern Indian mysteries. Following in the broad wake of Tony Hillerman, Aimee and David Thurlo and others, he brings a sharp eye and a tender heart to this tale of a conquistador's treasure hidden somewhere on the vast Navajo Reservation. 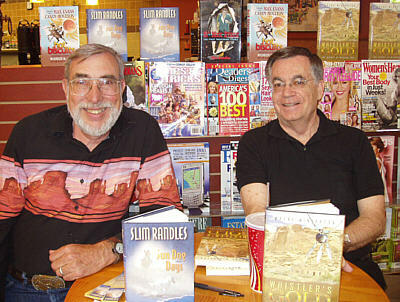 Slim Randles, (Albuquerque, NM), syndicated columnist (Home Country), and monthly contributor to New Mexico Magazine. I've just finished Whistler's Gold and I enjoyed it immensely. Very readable. I'm impressed with Winterton's gift for plot. I can smell more books coming and I hope I'm right. I love a good mystery and this is a good mystery. Diane C. Limberg, (Salt Lake City, UT), from a review on the Amazon website. This was such a fun book to read, it was hard to put down. It combines my two favorite things, love and mystery. It is crying for a sequel. Grace and Kee are in my head and I cannot get them out. Milt Lowe (Casa Grande, AZ), from a review on the Amazon website. I think Whistler's Gold is a fabulous book. Excellent story line and plot. It was hard to put down to give my old eyes a rest. I look forward to other books by the author. Click here to read Norman Goldman's complete review. Once you are into the narrative it becomes increasingly difficult to put down. Another plus is that the novel's setting did make an impression on me ... particularly as Winterton blends his vast knowledge of Navajo culture into the narrative. Whistler's Gold has, at the heart of it, a love story. The love story itself is enjoyable, but Whistler's Gold is much more than that, with several mysteries rolling out seamlessly alongside the romance. Winterton has managed to blend the genres of mystery and romance together in a book that is entertaining on many levels. * Wayne Winterton began his career in 1963 as a teacher, and later as the principal of two residential schools on the Navajo Reservation. He was also the Superintendent of the Albuquerque Indian High School, Superintendent of Schools for the Northern Pueblos Agency, and during 1978-1979, was the interim President of the Institute of American Indian Arts, a junior college in Santa Fe. In 1979, he left education to work for the federal Office of Surface Mining, first in Kansas City, Missouri; and later, in Tulsa, Oklahoma. In 1986, he returned to the field of education by joining the staff of the Bureau of Land Management's National Training Center in Phoenix, Arizona, as the Division Chief for Administrative and Media Services and, later, briefly, as Center Director. He retired in 2004 with over forty years of federal service. 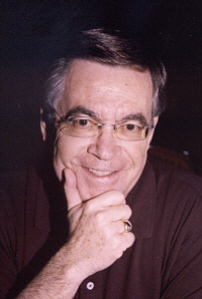 He received his PhD from the University of New Mexico in 1976, and is a member of the Arizona Authors Association.